Work: Admitted to Pennsylvania Bar, 1750; Crown Prosecutor for Carlisle, twelve years; Elected to Provincial Assembly, 1768-1776; Elected to Continental Congress, 1774, 1776-77; Colonel in the Continental Army, 1776; Vice president of the Pennsylvania constitutional convention, 1776; Judge of the Admiralty Court of Pennsylvania, 1779. George Ross was born in May of 1730 in Newcastle, Delaware, into very large family. His father was a minister, educated at Edenburgh, and the Ross children received a sound classical education at home. George then proceeded to read law at the office of his older brother, John. George attained the Bar in Philadelphia at the age of 20 and established his own practice in Lancaster. As was typical of many gentlemen of the day, his politics were Tory. He served for some twelve years as Crown Prosecutor (attorney general) to Carlisle, until elected to the provincial legislature of his state in 1768. There he came to understand first hand the rising conflict between the colonial assemblies and the Parliament. He was an unabashed supporter of the powers of the former. In 1774 he was elected to the provincial conference that would select delegates to attend the General Congress, and was selected as a representative of Pennsylvania that same year. 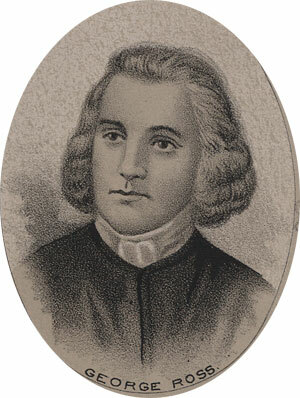 Ross continued to serve his provincial legislature and was a member of the Committee of Safety for his colony in 1775. In 1776 he was again elected to the Continental Congress, while serving as a provincial legislator, and a Colonel in the Continental Army. That year he also undertook negotiations with the Northwestern Indians on behalf of his colony, and took a seat as vice-president of the first constitutional convention for Pennsylvania. He was reelected to the Continental Congress once more in 1777, but resigned the seat before the close due to poor health. In March of 1779 he was appointed to a judgeship in the Pennsylvania Court of Admiralty. He died in that office, in July of the same year.